Enliven the appearance of a beautiful Legend Spirit gas fire from The Fireplace Warehouse with the addition of this charming modular coal set. It helps create the illusion of a flickering fire blazing on the hearth! During chill winter weather, this attractive decor item offers appealing beauty. Use it to enhance the impression of heat (and warmth) emanating from the fireplace. The faux black coals included with this modular coal set for the Legend Spirit gas fire all form a compact unit. It consists of several components: a front coal strip, a matrix, a rear coal strip, the coals, and a side coal strip. While highly realistic in appearance, these items won't separate easily from the fuel bed. Nor will they leave dirty coal residues on the fireplace. For thousands of years, the shimmering beauty of a coal burning fire has brought pleasure to households around the world. Now, your existing Legend Spirit gas fire will appear even more realistic in appearance with the addition of this accessory. 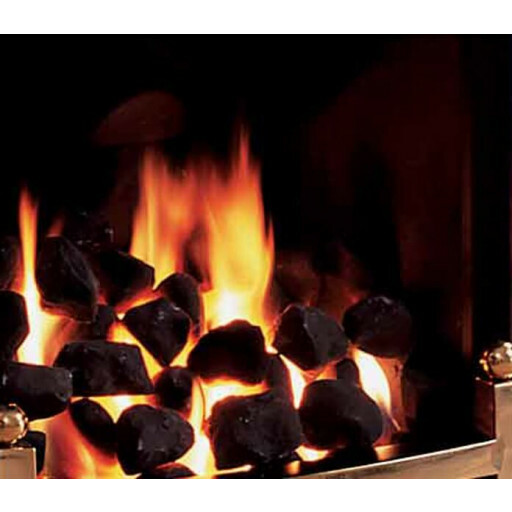 The modular coal set supplies a great gift item for anyone using a compatible Legend Spirit gas fire. It also supplies a nice addition to Legend Spirit gas fires in commercial locations. See this item today at The Fireplace Warehouse!